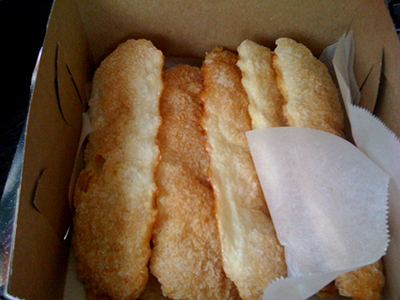 Aprille did me a favor and has been stalking Genesee Bakery to let me know when they have tea leaf pastries available. As soon as she tweeted me, I stopped by after work and picked up a few. I don't know how to describe them... they are light and crispy and sweet. I have never had anything like them. I can't find out anything about them online either. Only on the Genesee Bakery website... tea leaves... $1.35. Genesee Bakery also has a Facebook Fan Page! Now I can drool over their baked goods on Facebook too.